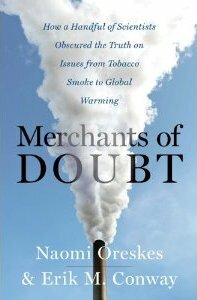 I have written previously about the excellent new book called Merchants of Doubt: How a Handful of Scientists Obscured the Truth on Issues from Tobacco Smoke to Global Warming by Naomi Oreskes and Erik Conway. I recently had the good fortune of hearing Professor Oreskes speak about her book at McGill University. Hers is a truly compelling, remarkable and shocking story of deliberate scientific malfeasance with many of the same players who provided the scientific cover on behalf of tobacco companies in the 1960s and 70s now plying their trade in the service of oil and gas companies who are fighting regulations to reduce greenhouse gas emissions. Why do they do it? Is it simply for the money? As Professor Oreskes explains in her speech, the truth about those scientists who fight to deny the reality of human-caused global warming is about much more than money. They are fighting instead for a deeply-held ideological conviction in the supremacy of free markets and neo-liberalism. To some, environmentalism and its attendant increase in regulations is the first step on the slippery slope to socialism. Although these scientists may well know that the science of global warming is real and virtually indisputable, a warming planet is no match for the greater evil that is the gradual erosion of economic freedoms that they believe would be bound to accompany any serious attempt to reduce greenhouse gases. Increasing regulations means more market restrictions and, to their logic, the inexorable march toward socialism. A spurious hypothesis you say? Click the audio player above and listen to her speech. You may be surprised by what you hear. For anyone involved in the struggle to wean ourselves off fossil fuels and confront the gravely serious problem of global warming, this book is a must read. Described as “one of the most important books of the year“, ‘Merchants of Doubt‘ is a new book by science historians Naomi Oreskes and Erik Conway. The authors researched the inner workings of the policy-stalling denial machine that works to confuse the public about climate science, the health impacts of tobacco, ozone depletion, the dangers of DDT and other environmental or public health issues. Delving into the root of the problem, this work sheds light on the question of why confusion still surrounds the reality of human-caused climate change despite the overwhelming agreement among the world’s leading climate scientists about its causes and ever-advancing understanding of its consequences. The authors explain in exhaustively-researched detail how renowned scientists abandon science, how environmentalism has become equated with communism, and how the Cold War has come to be connected with climate denial.